The word martial law is only a poison to Liberal Party members and supporters. The rest of the people seems to be in favor of it to topple insurgencies in Mindanao. 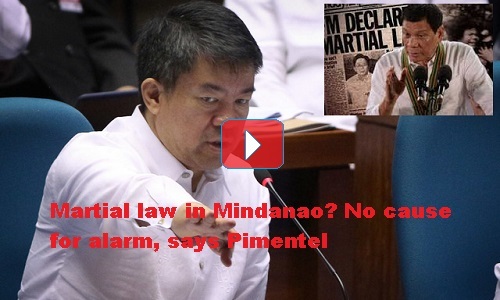 Even Mindanao residents like Senator Koko Pimentel is confident that the president only declares it when the need arises. Not much resistance can be felt from netizens online when in the end, martial law is indeed declared to put rebels and terrorists back into order. [VIDEO]: Ang preidente ay posibleng magdeklara ng Martial Law sa Mindanao para masugpo ang karahasan doon. The President said that he won’t hesitate to resort to martial law in Mindanao if violence worsens. Destabilization or the fight between the military and the rebels are grounds for martial law. PDu30 swears that if local officials refuse to help him in the war against the NPAs, then it’s time to go for it. He pleads to get the support of the leaders in the region to reprimand chaos before it goes out of control. That could only be the reason that he is compelled to exercise extraordinary powers that he has. He reminds the people of the brutal war it can bring. Senator Koko Pimentel, a staunch ally of the president said that there’s nothing to worry about. He assures that the President only decides on that to “bring back normalcy and order” in identified areas in Mindanao. He insinuates that this can do more good than harm. The president makes sure that there’s no power abuse and also not interested in staying in power longer. It is very certain, however, that Vice President Leni Robredo makes a lot of noises again after the martial law remarks of the president.This is an opportunity for her to repeat false accusations during the Marcos regime – in her attempt to discredit Bongbong Marcos for the Vice Presidency. The electoral protest against her is delayed due to her constant motions for reconsiderations in every step. Atty. Vic Rodriguez in behalf of the Marcos camp shows his disgust that Robredo deprives Bongbong Marcos of his day in court. He said that if the Vice President is very sure of her win and really has no knowledge of cheatings done in her favor then, she won’t block the beginning of the preliminary conference proceedings. As early as now, it looks like Vice President Leni Robredo is guilty of fraud, based on Atty. Rodriguez’s assessment. Next post: Can the Extra-Marital Affair Affair of the Dead President Destroy Bongbong Marcos’ Family?